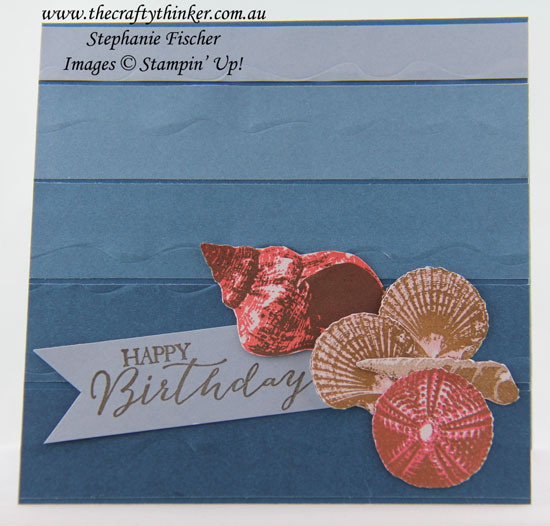 Welcome to the Crazy Crafters' Blog Hop with our Special Guest stamper, Martha Inchley - we are thrilled to have Martha join us this month and so excited to CASE (Copy And Selectively Edit) any project that has been created by her. As a member of the Artisan Design Team, Martha is the source of much inspiration! I have turned the design onto its side and replaced the bow with some shells. My plan was to make life easy for myself and use the Color Theory paper to reproduce the strips of paper in Martha's card. 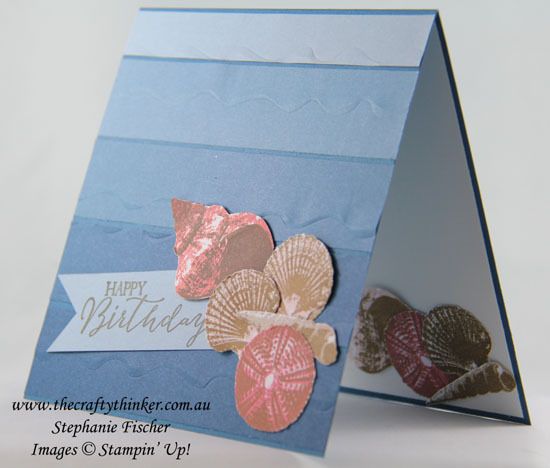 In my mind the ocean effect would be enhanced by using the Ruffled 3D embossing folder. In reality, it looked like a confused mess! Faced with the choice between starting again or finding a way to rehabilitate the existing mess, I used my Stampin' Trimmer to remove the white stripes and glued the remaining strips to my Dapper Denim base card. I'll admit that I struggle a bit with two-step stamps (we all have our own strengths and this is not one of mine!) but I was quite happy with the results. For the largest shell I used a mixture of Calypso Coral and Early Espresso. The two scallop shells are Powder Pink and Soft Suede. For the spiral shell I used Crumb Cake and Soft Suede and the Sea Urchin is Flirty Flamingo and Soft Suede. I stamped the greeting with Soft Suede ink onto a piece of the Color Theory paper and hand cut the banner end. 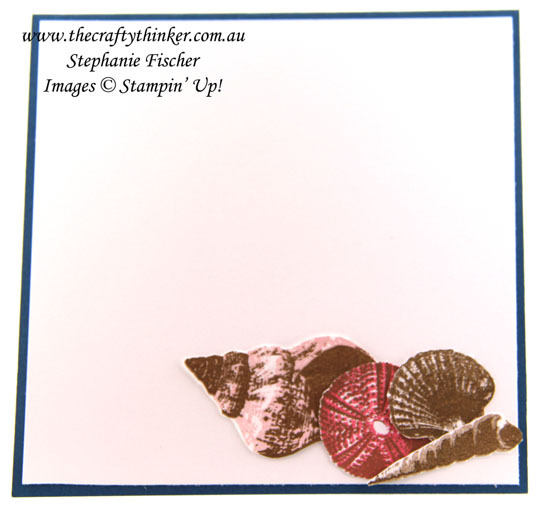 I used similar shells to decorate inside the card except for this large shell I combined Powder Pink and Soft Suede.